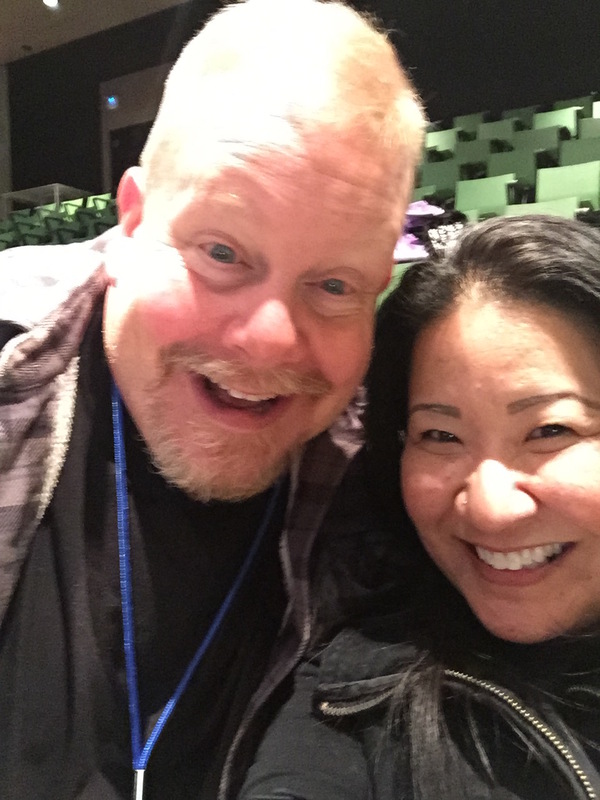 This past Saturday, I had the great pleasure of attending GRNW 2015. This event was birthed from an idea, over beers, by one of our very own blog team members, Tracy Timmons-Gray. For those of you who know ttg, you’re most likely already a fan. But getting to see her in the flesh, be inspired by her energy, be motivated by her tireless commitment to the success of this org and this event, be entertained by her humor…well, let me just get these first applause out of the way! Way to go, Tracy! 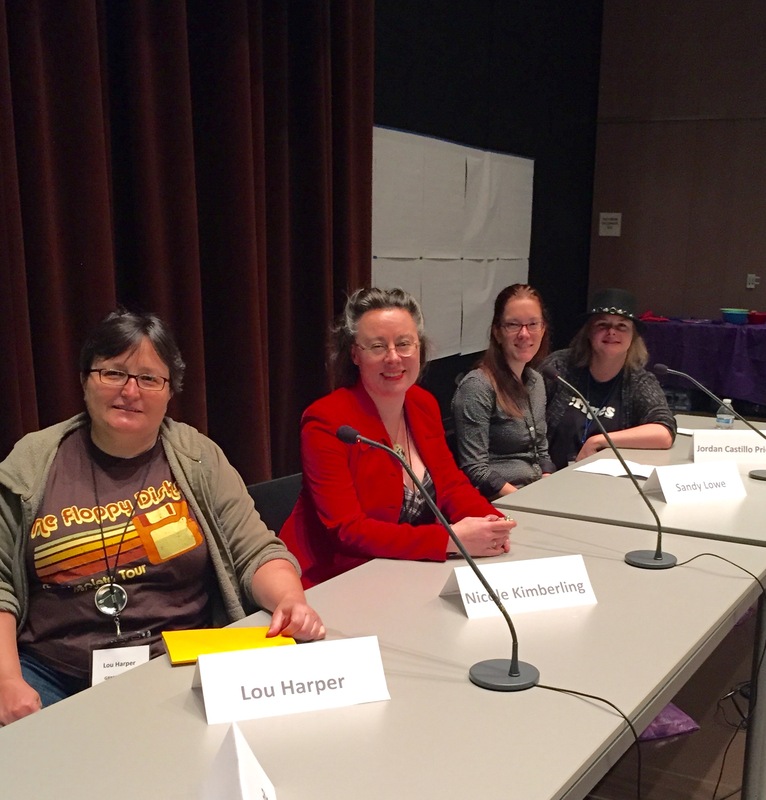 The event was held at the Seattle Public Library and what I liked so much about this meetup was that it ran as ONE group…authors, readers all participating together. From the keynotes to the panels to the discussions, we all intermingled and the conversations were fascinating and informative. Check out ALL our ideas and notes from the group discussions! The keynotes this year were from 3 people focused on the topic “Read With Pride”. I was honored to be able to participate as one of the speakers sharing my story. SO VERY NERVOUS (terrified, actually), I don’t remember much. But, I do remember that my fellow keynoters (Jessica Blatt & Austin Chant) had some great tales to tell! All 3 of the keynote stories will be posted on the GRNW website. We also had some amazing panels! From celebrating characters over 40, discussing research for a book, talking about underrepresented characters, and many more (!!! ), the panels were a highlight. Talking here about self-publishing vs traditional publishing are Lou Harper, Nicole Kimberling, Sandy Lowe, and Jordan Castillo Price! It was so great to see familiar faces and meet so many new people! I got so many books signed, fangirled a lot over Ginn Hale, got my tarot card read by Andrea Speed, badgered Astrid Amara for more holiday books, had the most encouraging and affirming chats with Devon Rhodes, and selfishly snagged as many hugs from Heidi Belleau as I could get! Loved getting to meet so many readers that I interact with online as well!!! Me and a forever favorite, Edmond Manning. Jordan Castillo Price with Boys In Our Books blog member, Kristie! 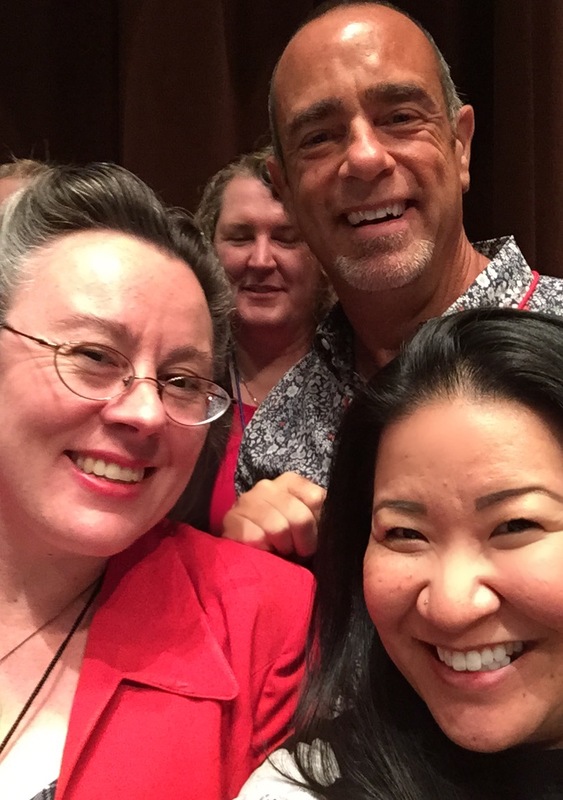 Sneaking a selfie w/ Nicole Kimberling and Rick R. Reed during the authors/speakers group picture! Overall it was a jam-packed but AMAZING day! If you can get yourself to the great northwest next year for the meetup, I’d HIGHLY recommend it! So inclusive, fun, celebratory, informative and WORTH IT! 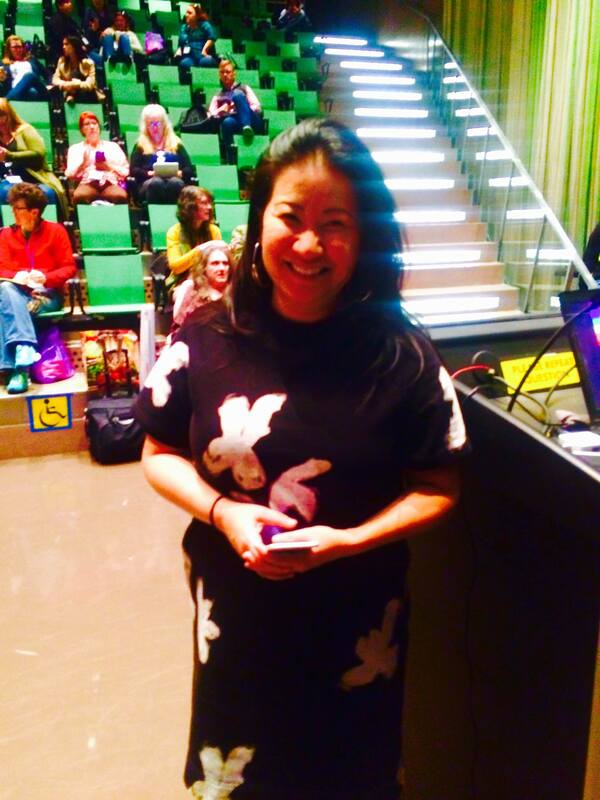 Your keynote speech was lovely and moving and I was so thrilled to hear it, and to meet you in person. Such a fun day! That just looks like everything a meetup should be. I adore the post it note board. Any idea what the attendance was? I haven’t seen the final numbers yet–still need to debrief with the rest of the team, but going into the day, not counting passes bought that morning, we were over 160. It nice size and it was good to see strong turn-outs to all the panels. THANK YOU, Susan, for your wonderful write-up and to you and Kristie attending. It was a JOY to meet you both finally, and to have you part of the event and the keynote was a real gift. ***Hugs*** from Seattle! From my strange vantage, it was a great day. 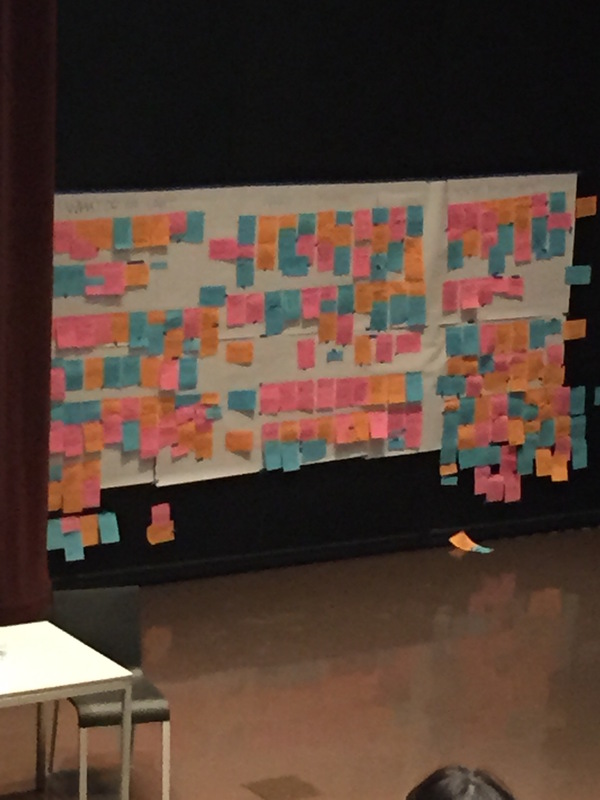 I feel like every year we learn and adjust, and the things we adjusted for this year, from having panel submissions to doing the sticky-note activity, etc, helped us build toward that inclusive community feeling that we’re working for. I’m so grateful for everyone who joined us and made it the day that it was. I kind of feel the same way, Lisa! I love how small the event is. The whole day feels so welcoming and like home away from home. There was so much laughter, so many smiles, massive amounts of hugs and kisses, and a genuine sense of community. Inclusive Community. It’s really a beautiful thing and I can’t wait until next year. 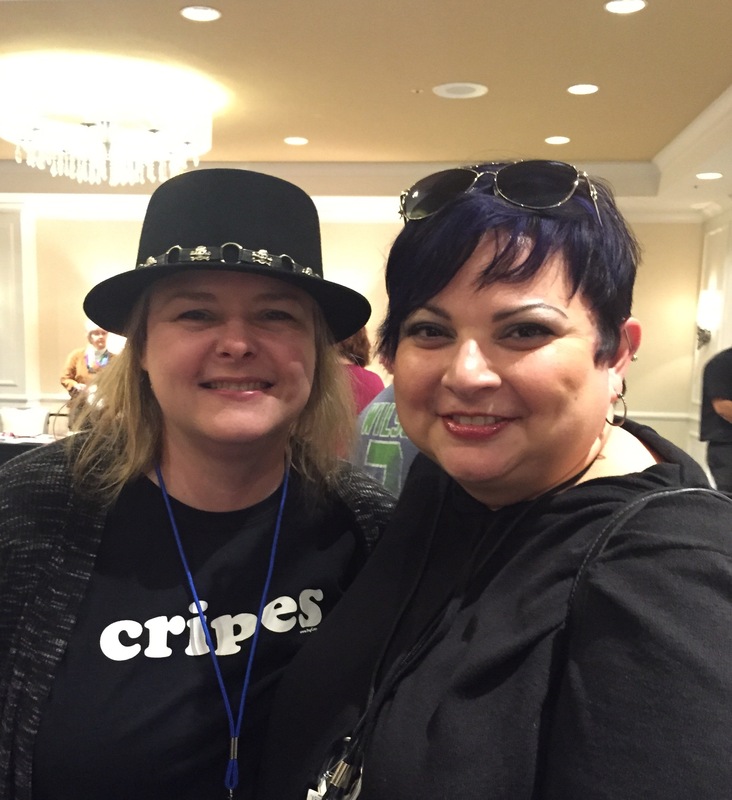 This entry was posted on September 28, 2015 by susan in News and tagged GRNW Meetup.